A joyful and infectious pastiche that marries some of Offenbach’s best music with Don White’s witty and irreverent English version of the discovery of America. A joyful and infectious pastiche that marries some of Offenbach’s best music with Don White’s witty and irreverent English version of the discovery of America. 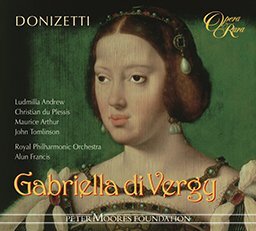 Weaving together music from lesser-known Offenbach operettas, this opera tells the story of Columbus asking Queen Isabella of Spain for funding for his journey to America. An alcoholic nymphomaniac, Isabella donates her jewellery in a kind of strip show. Three ex-wives follow Columbus onto his ship and he is seasick for the whole journey. On arrival in the New World he discovers the cola nut. 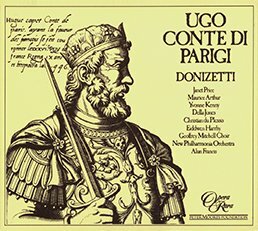 Maurice Arthur (Christopher Columbus), Joy Roberts (Beatriz), Johanna Peters (Rosa Columbus), Lissa Gray (Fleurette Columbus), Marilyn Hill Smith (Gretel Columbus), Christian du Plessis (Luis de Torres), Alan Opie (Chief of Police), Anna Dawson (Queen Isabella), Alec Bregonzi (King Ferdinand), Clive Harré (tourist), John Duxbury (waiter), Rosemary Ashe (Princess Minnehaha Columbus), Geoffrey Mitchell Choir, London Mozart Players, Alun Frances – conductor. 03 Christopher Columbus: Act I: La, la, la. La, la, la, la. Ah! 12 Christopher Columbus: Act I: What have I done? 22 Christopher Columbus: Act III: Has anyone seen Columbus? 28 Christopher Columbus: Act III: Nevermore will we roam, we’re heading for home! 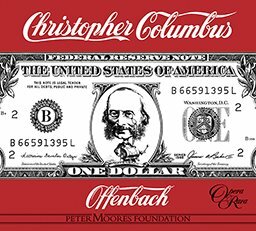 You will look in vain for Christopher Columbus in lists of Offenbach's works. It was put together by Opera Rara for the 1976 American bicentenary celebrations, using a totally new book allied to music from a variety of Offenbach works. But not without reason did the Daily Mail call it "the best Offenbach opera Offenbach never wrote". It is an absolutely hilarious piece, right from the opening chorus in which the young ladies of Cordoba express their boredom at having nothing to do but snap their castanets and shout "016!". The lyrics are quite brilliant and, if the whole doesn't sound quite like an authentic Offenbach piece, it is only for the very good reason that it largely foreswears dialogue and the lead-ins to numbers in favour of the juicy central bits. With singers and singing actors of the quality of Marilyn Hill Smith, Johanna Peters, Anna Dawson and Alec Bregonzi supporting Maurice Arthur, it would be difficult to imagine the piece performed with greater skill or relish. If you want a CD set for sheer uninhibited enjoyment, this should be it.